Navigating Walla Walla High School like entering a bustling urban center. Voices, footsteps, jackets and backpacks jostling all come together to form the borderline mayhem that is the transition between classes and the rush to get to the bus or get home after a long day of school. Yet in the commotion, I am fortunate to witness a kind of calm and ease that stands out amongst the social energy of WA-HI. In the library, I have the opportunity to witness some of my College Coaches working with their WA-HI students. It’s only the second week of our volunteering, but already Coaches Caitlyn Smith and Alex Hulse are hard at work. Caitlyn and her student, Alexis (pictured left), are having a conversation about Alexis’s dream to go to nursing school. On the other side of the library, Alex and his student, Julian (pictured below), are going over the nitty gritty of his assignments for the semester. This is the second semester Alex and Julian have been paired together, and today I get to experience the strangely satisfying moment of meeting someone whose name you have seen on paper in matching and whose progress you have heard about over e-mail, but have never met in person. Although I am an extremely amateur photographer (as in, I take less than ten photos a year) I have to say I feel pretty satisfied with the shots here today, not for their artistic composition or profound symbolism, but because they accurately reflect my own experience as a Coach in the two years I participated before becoming the program Intern. When you sit down with a high schooler and ask them what their goals are in their College Coaches sessions, some know right away, and some are clueless. But the reality is that all of them have something in common, a sort of unspoken goal: they are looking for a space in which to dream, to share with someone who is in the middle of the college experience. Sometimes the reality that goes along with these dreams isn’t so simple. Sometimes students are woefully behind in classes, with zero notes taken in their classes, or who have skipped a few periods here and there. College aspirations are a little more challenging to address when this is your idea of academic responsibility. No matter what the situation, however, I have witnessed this program’s ability to be all at once kind, fair, and idealistic – all because of the wonderful Whitman volunteers I have been able to match with their WA-HI students. My joy in being an intern has been recognizing that the work we do at the high school – while composed of the daily practical advice – is really about that space to dream. 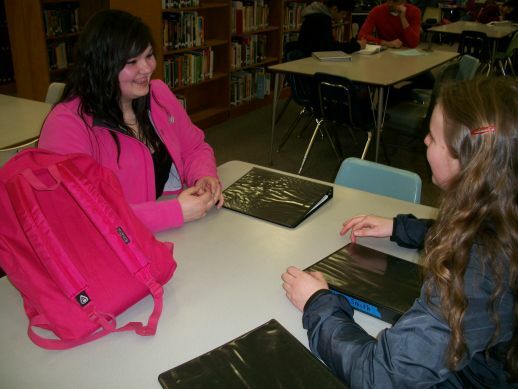 The one-on-one setting allows for WA-HI students not to be just another 10th grader in a sea of others, but instead to be the excited student who wants to be a nurse. Learn more about College Coaches.